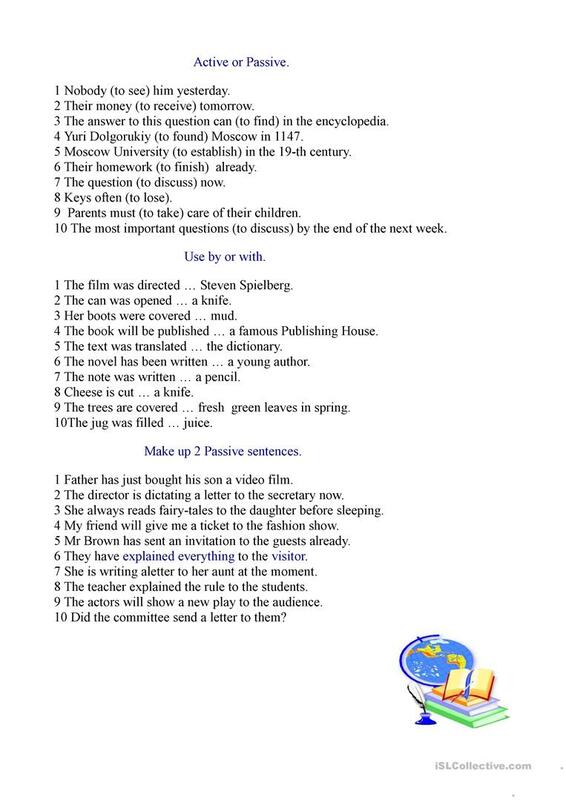 Exercises for oral and grammar practice while learning Passive Voice. The worksheet includes the Active and Passive sentences in different tenses, the prepositions by and with and sentences where 2 Passive variants are possible. The above printable, downloadable handout is recommended for business/professional students, high school students and elementary school students at Pre-intermediate (A2), Intermediate (B1) and Upper-intermediate (B2) level. It is aimed at consolidating Passive voice or active voice in English, and can be used for working on your class' Speaking, Reading and Writing skills. You will find the solution at the end of the worksheet. tatanat is from/lives in Russia and has been a member of iSLCollective since 2014-08-15 09:58:51. tatanat last logged in on 2019-04-13 19:24:46, and has shared 154 resources on iSLCollective so far.